No, that's not in reference to myself. Yes, it has been a while. But let me explain. It all started two years ago. I decided then I'd like to make some money on my own. So I got a loan and started working for myself. Well not entirely. I started temping, which worked out great. I had fairly easy jobs which eased the stress and it allowed evenings and weekends to do my work. Skipping ahead to now, I have a full time day job at an office and come home to work more on evenings and weekends, not to mention I am doing a lot more for my own business, which took a year and a half to get going properly. That's a story in itself. But I'm not here for that story, I'm here for a story about the Library. I just told you all of that so that maybe you can get a glimpse that my time is limited. Even with all of this work, I do frequent the Library. It just takes a little more work. Thankfully, the Library is fairly organized which allows me to organize. A lot of Libraries offer many different resources and do what they can to keep you updated. For example my Library hosts not only books but many other print material, electronic material and audio/visual materials including a film theatre. They release monthly updates on the website and a paper hand out, which I grab every time I see a new one in the entrance. The film theatre is really a treat to have, I know smaller communities don't have this luxury. What's also great is that it offers a different playlist than theatres Angry Charlie likes to visit or, for that matter, most people. 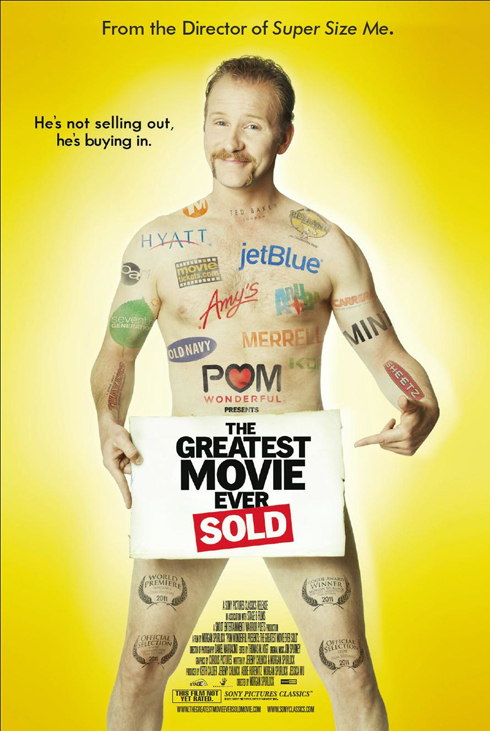 The movie follows Morgan as he tries to get a documentary paid for by advertisers and product placement. With the odd touches of actual insight into the world of mix marketing, most of the movie seems to follow Morgan, meeting with people, organizations and companies to buy and sell ad space. Whether it's the hilarity of Mane and Tail or pondering the issue of schools generating funds through advertisements, Morgan makes everything easy to grasp. But then again, his approach seemed like we should already know what/when we are being sold, so why not have some fun with it. It's kind of the same approach he always seems to take and it fits, as usual, perfectly. It was everything I expected and unlike a lot of popular movies I do watch, PWPTGMES wasn't a let down. I left laughing, thinking and talking, which is exactly what I wanted. The three greatest things about the movie are actually what I was thinking during the movie and these three things make me appreciate the fact that people like Morgan exist and do things like this. 1. At some point you have to question his motives. Where did promotional deals cross with what he “has” to say, do or present? This point could have been a downfall but, given the content, seems like Morgan's way of creating audience participation. Only it's more fun because it seems like a game of cat and mouse. 2. I could hardly imagine the legal/contract work of this movie. It would be unbelievable to try and decipher what you had to do between all the deals, how to keep them organized and keep clients happy. 3. I want more. The movie didn't seem like a movie, it seemed like it was the behind the scenes of a movie so now I want the movie. And a collector cup. I also know there is a lot he did that is not in the movie and would be in the DVD Special features. So I am eagerly awaiting the release. I want so much more, so I am now looking for the DVD release of 30 Days which I missed on TV. I can't seem to get enough Spurlock, and if you have been living under a tree for God's sake go check out his stuff. He started strong and continues to be strong. He's like the Pixar of documentarians. I liked this article you wrote M, because I had a lot of questions about this movie myself. I actually heard it described as just one giant smirk - not really hard hitting, but more like a giant joke. Like, look what I can do type stuff. One review I read actually brought up a good point though. The movie you really want to see is the behind the scenes making-of of this movie, more than the finished film itself. Because, like you bring up, you want to see how the business end actually worked more clearly. You should also check out the documentary Fat Head on netflix, as it brings to light a lot of details about Spurlock's Super Size Me and how he's gone a bit Michael Moore in how he fudges the details to drive home his point. It's all fascinating stuff.